Polyphony Digital hass added microtransactions to Gran Turismo Sport in its July update. 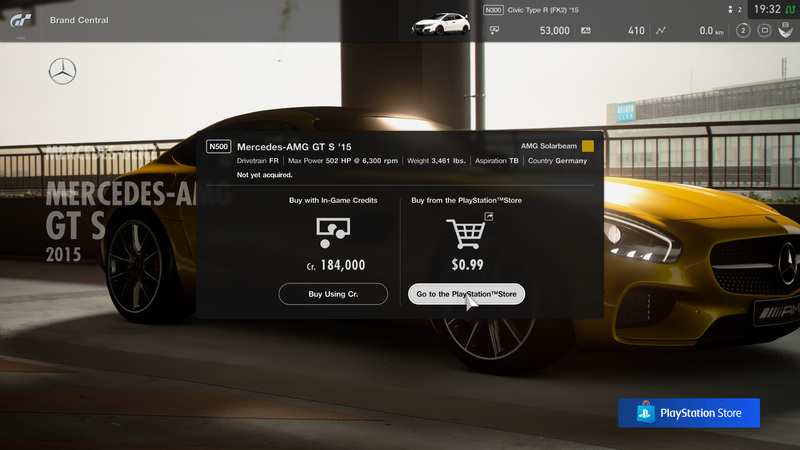 The new feature, which is detailed in the official update notes, allows players to buy in-game cars for real money. This only applies to cars priced below 2m credits, however; the best cars will need to be earned just as before. According to Eurogamer, the microtransactions are already live in Japan, where prices run between ¥100 and ¥300. A screenshot published by Sony Interactive Entertainment shows a transaction worth $0.99. Exactly how the Gran Turismo fanbase will respond to this move remains to be seen, but microtransactions are now virtually standard in a wide range of AAA franchises. However, the public sensitivity to monetisation tools is evident in Turn10's decision to remove both paid tokens and its loot box equivalent "prize crates" from Forza 7. "While we've never charged money for prize crates in Forza Motorsport 7, their presence in the game has continued to be a source of controversy," the studio said in a blog post. "The overwhelming feedback has been that this system feels out of place in the game."